From Marietta/Lancaster Area: Take Route 441 to Route 743 N/Maytown Rd. Follow Route 743 N/Maytown Rd. for about 5 1/2 miles and the place is on the left. From Etown/Mount Joy area: Take Route 230 to Route 743 S/Maytown Ave. After about one mile, the place is on the right. Main Entrance is along Route 743. 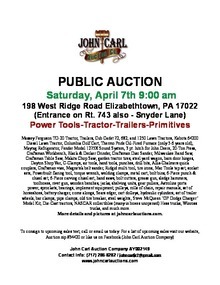 Download "APRIL 7 ETOWN SALE BILL.pdf"